Born out of wedlock, Brienna is cast off by her noble family and sent to Magnolia House – a boarding house for those looking to study the passions: art, music, dramatics, wit and knowledge. Brienna must discover her passion and train to perfect her skill, in the hope that she will one day graduate and be chosen by a wealthy patron. As Brienna gets closer to the eve of her graduation, she also grows closer to her smart (and handsome) tutor, Cartier. He can sense that she is hiding a secret, but Brienna chooses not to reveal that she is experiencing memories of her ancestors – memories uncovering the mysteries of the past that may have dangerous consequences in the present. A daring plot is brewing – to overthrow the usurper king and restore the rightful monarchy – and Brienna’s memories hold the key to its success. 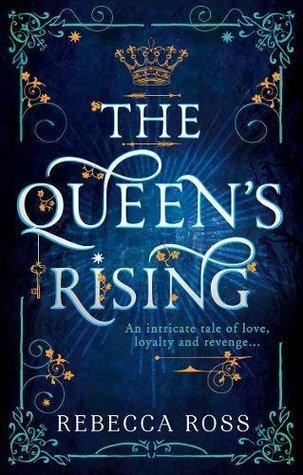 The Queen’s Rising is a brand new fantasy book about a young girl sent to a boarding house to keep her occupied and away from finding out the identity of her father. Despite asking for the truth for most of her life her grandfather refuses to ever speak her father’s name and instead she is pushed away and spends seven years working towards mastering a passion in one of the five fields – art, music, dramatics, wit and knowledge. Brienna attempts four passions without any success until she finally come to knowledge as a last resort. Now the day they showcase their talents in the hope of finding a wealthy patron to adopt them is closer than ever and Brienna’s mind is on an entirely different manner when strange memories of another person’s life come to her with a quest. This book reminded me so much of one of my favourite, possibly the number one favourite, fantasy novel and that’s the Queen of the Tearling series. I was absolutely in love with all three books in that series and the moment Brianna started having memories she couldn’t explain of someone else’s life I was instantly transported back to that same sort of glee and fascination of that book. If you loved that series I would definitely recommend this book because the world building and great fantasy was very much the same but this book came into its own too with wonderful relationships between the main character, her friends and her handsome tutor. Anytime Brienna and Cartier were together as well I was so happy and I really wanted them together despite not knowing much about their relationship and the slow build-up towards some adorable parts between the two of them. I loved the history of this book too and it was explored in deep detail because Brienna herself was studying the historical side in most of her knowledge tutoring. That means the author was really able to write so much into the past of the character’s family, country and neighboring countries and enemies too so that helped towards understanding the world. Overall I’m glad I read this book since it was a very enjoyable read but it did take me a few tries to really get into the start of the story since it was a slow-moving plot. Plenty of events did happen over the course of the book but it was more of a creative and thoughtful story and less action packed like a lot of the fantasy books I’m used to reading. I might not have been in the right reading mood for a slow-paced fantasy so I really would have taken my time with this one if I had the time because it was a perfectly calm-paced and lush world with so many mysteries and secrets brewing it the background ready to hopefully come to action in the next book.